Development Initiatives, based in the United Kingdom, recently released its annual Global Humanitarian Assistance Report on 19 June 2018. This report includes data from 2017 and ranks the Republic of Turkey as the leading country in humanitarian assistance with more than 8 billion USD in aid. According to this report, United States ranks as the second country with 6.68 billion USD, whereas Germany is the third (2.99 billion USD), followed by the United Kingdom (2.52 billion USD) and the European Union with 2.23 billion USD. The report further acknowledges that Turkey is ranking still the first when the total humanitarian assistance is proportioned with the national income. Based on that calculation, Turkey is being the most generous country in humanitarian assistance by providing 0.85 percent of its national income. It is noteworthy to state that Turkey is consistently ranking high on Global Humanitarin Assistance reportings. In 2016, for instance, Turkey was ranked as the second only after the United States, with another generous contribution as high as 6 billion USDs. One should also note that, Turkey’s humanitarian assistance programs are also acknowledged by the OECD Development Assistance Committee. Turkish hospitality and generosity have been demonstrated several times during their long history of statehood. It is not extended for the first time to the Jews in 15th Century when they were expelled by the Spanish and nor it has not come to an end when they opened their country to the Syrians or Iraqis, who were fleeing away from violence in their countries in the recent years. It is a longstanding Turkish tradition to open its doors whoever is in need and protect them against even the most evil forces of the day. Looking at the recent history, one can spot Turkey’s increasing food deliveries to disadvantaged countries and regions since the beginning of 1980s. The amount of its humanitarian assistance has increased in value while the content and destination of the assistance are quite diversified in the following years. Since the first years of the 21st Century, Turkey has increasingly become a leader in regional and global humanitarian assistance through direct aid, development assistance projects and humanitarian diplomacy in not only its region, but also in a global scale. Africa is the leading continent in terms of receiving Turkish development assistance. 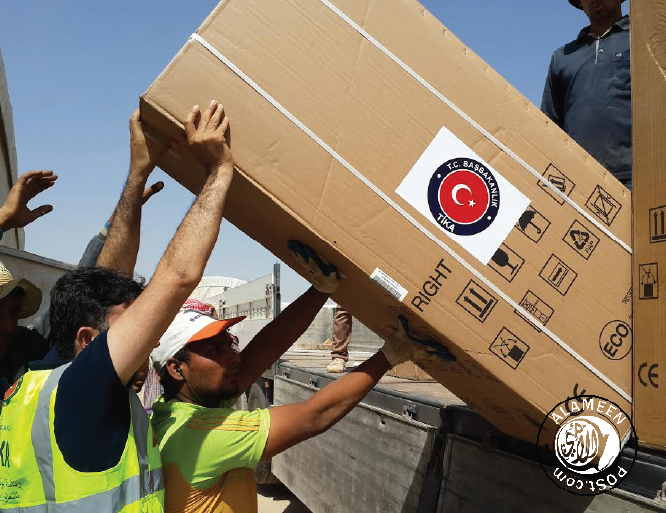 Turkey is also pursuing an active role in global humanitarian assistance system. In this regard, The Turkish Red Crescent Society and numerous Turkish NGOs are active on the global system. Turkey does not limit itself to bilateral assistance projects and increasingly contributes to the work of international organizations. In assisting UN’s humanitarian efforts, Turkey became a member of the OCHA Group, which brings leading humanitarian donors together. In line with its active role, Turkey hosted the first-ever World Humanitarian Summit in Istanbul on 23-23 May 2016, where 9000 participants from 180 member states, including 55 Heads of State and Government came together. This Summit served as an excellent platform to address the challenges of the humanitarian system and declare commitments for sustainable solutions for the millions of crisis-affected people. One of the key achievements of the Istanbul Summit was the recognition of the old debates on humanitarian and development divide should be transcended through a new way of working. In this context, all relevant actors should work together not only to meet needs, but to effectively reduce risks and vulnerabilities over time. The 2030 Agenda for Sustainable Development also provides a solid basis for this new framework. In fact, the combined use of humanitarian and development assistance programmes in a collective strategy has been the key of the Turkish humanitarian policy. On the first anniversary of the Summit, in May 2017 Turkey hosted a high level anniversary event and also the Istanbul Workshop of New Way of Working which is regarded as the most concrete outcome of the Summit and aims at implementing humanitarian and development assistance in tandem where necessary. - medical and foodstuff assistance for Palestinians in 2017 and 2018. Turkey’s humanitarian assistance for Syrians continues uninterrupted. In line with its commitments with international humanitarian law, Turkey pursues a compassionate policy towards Syrians escaping from violence in their countries. Turkey provides temporary protection for those Syrians seeking refuge. Turkey, which is also the main transit point for UN coordinated humanitarian assistance to Syria, is demonstrating an exemplary responsibility and shouldering a huge burden. Currently, Turkey is hosting more than 3.5 million Syrians in its territories. This is not a conclusive number for all the refugees in Turkey, as the numbers naturally increase when other nationalities are added to this already high number. Turkey’s last successful endeavour in Syria was an interim agreement reached under the auspices of the Turkish and Russian Presidents on Idlib, where more than 2 million civilians were threatened by indiscriminate use of force against themselves. With this agreement, another bloodshed in Syria was thwarted. In conclusion, Turkey is generously implementing a humanitarian foreign policy and this policy is derived from Turkish people’s longstanding traditions and customs of hospitality. Turkey’s humanitarian foreign policy is supported by international statistics of credible organizations. Turkey should not be left alone to shoulder the burden of humanitarian catastrophes and the international community better come to an understanding, where Turkey’s humanitarian foreign policy and contributions should become a norm and guide for all.